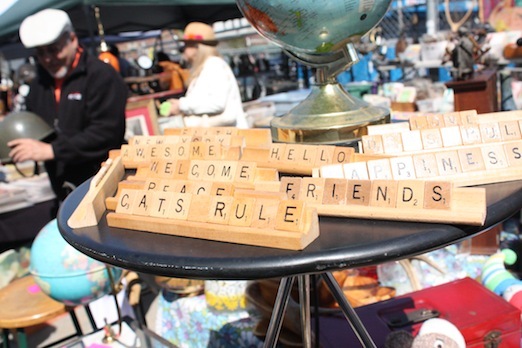 We Went to the Astoria Flea and Had Fun! 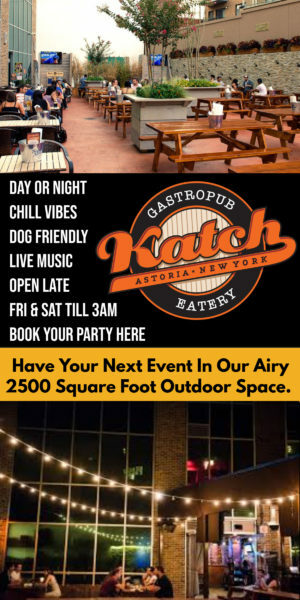 Astoria Music Now! Between 2 Bridges is Almost Upon Us! 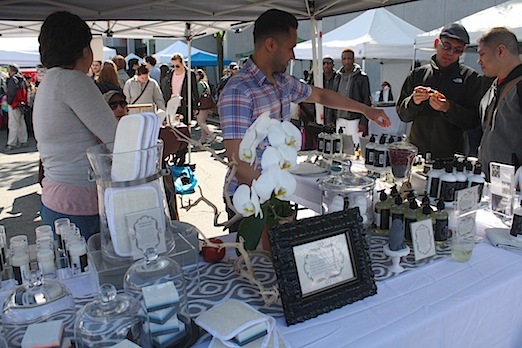 On Sunday, Emily and I went to the opening day of the Astoria Flea and really enjoyed ourselves. 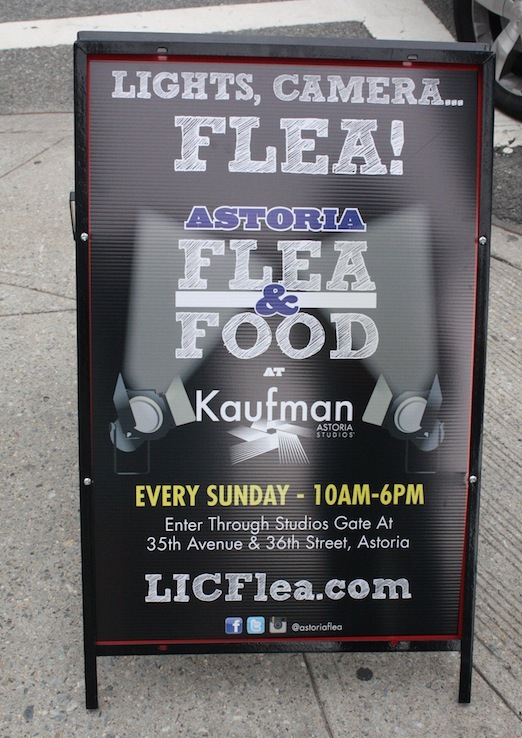 We loved the tasty food, spent time browsing the Flea side of things, and believe that this is great addition to Astoria. 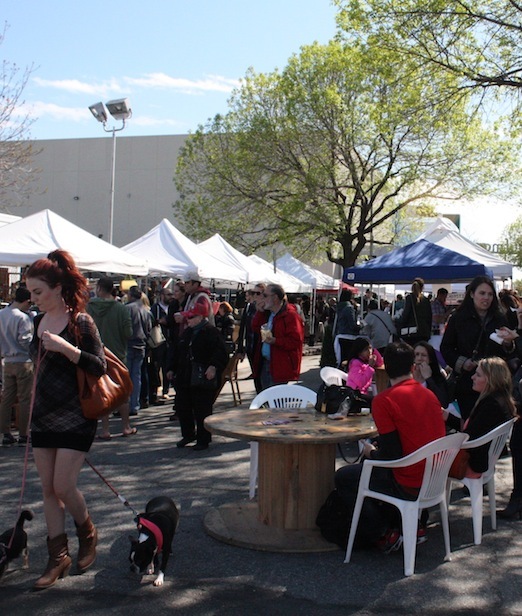 In fact, according to the Flea organizers, there were 10,000 attendees this weekend, which gets a big WOW from us. 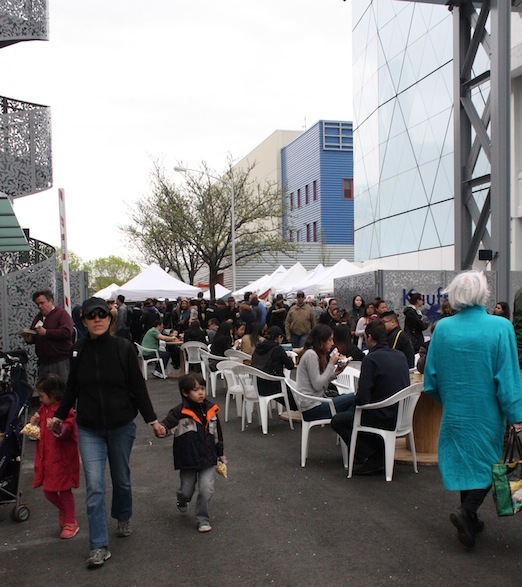 We started with the Food side (natch), accessed by the 35th Avenue side. 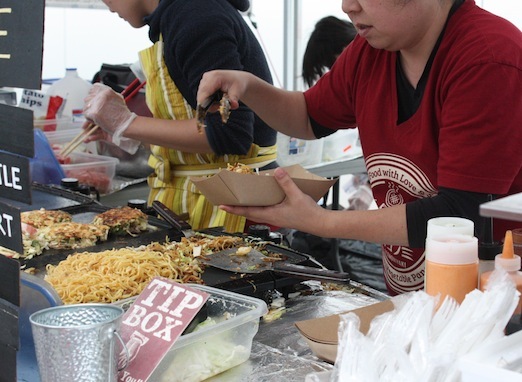 It was nice to see tables where people could sit and eat the food they bought. Lots and lots of people milling around beyond the seated. 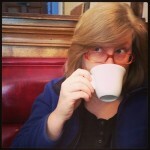 The first place we hit up was Tea n’ Milk. That’s Mathew behind the table. 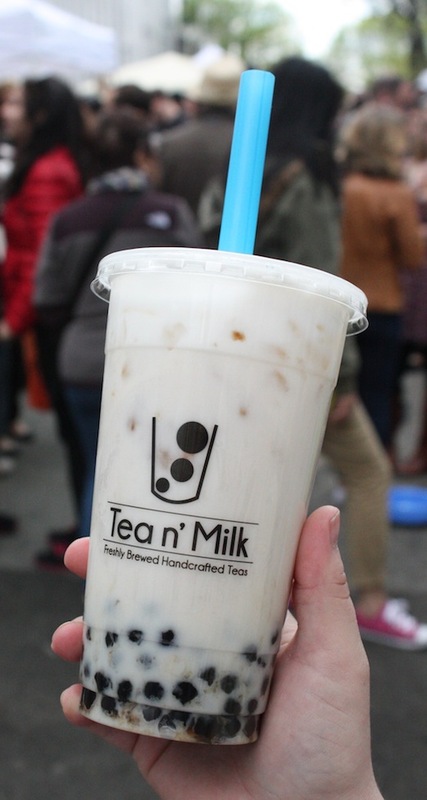 Both Emily and I chose a large taro milk tea with bubbles. They use actual taro root that they cook and puree for the drink, a detail that I think is fantastic—and unusual. 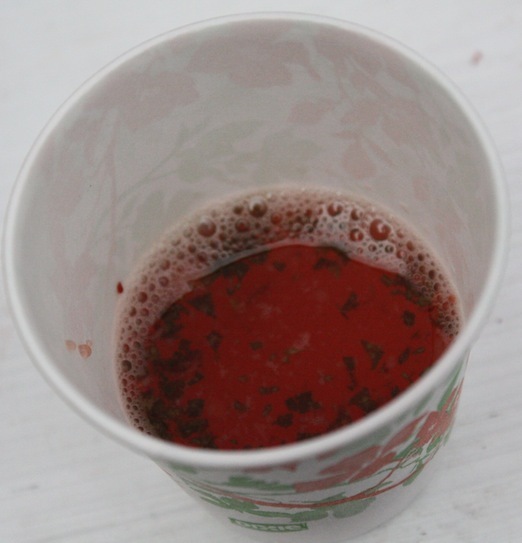 Our cups were filled with a generous amount of bubbles, too, which was a total plus. The resulting drink was sweet but not cloyingly so, and it was also white instead of the more conventional purple/lavender, which is the result of using a taro powder. 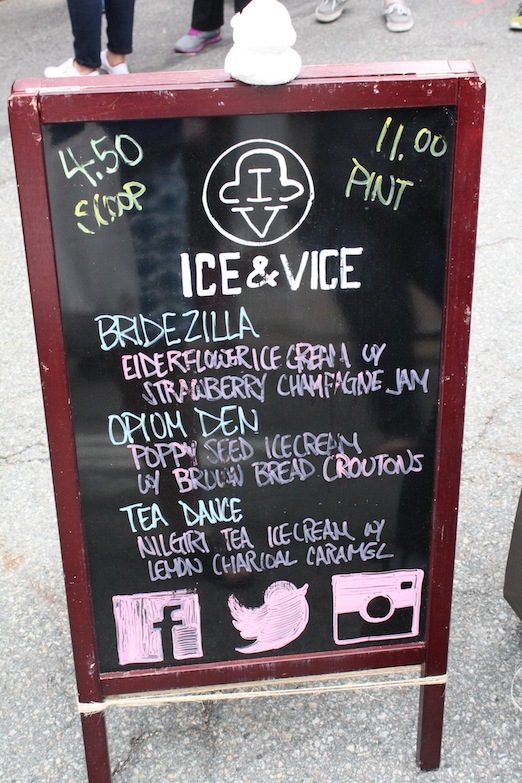 As we turned around, we spied the sign for… Ice & Vice! This was such a pleasant surprise. 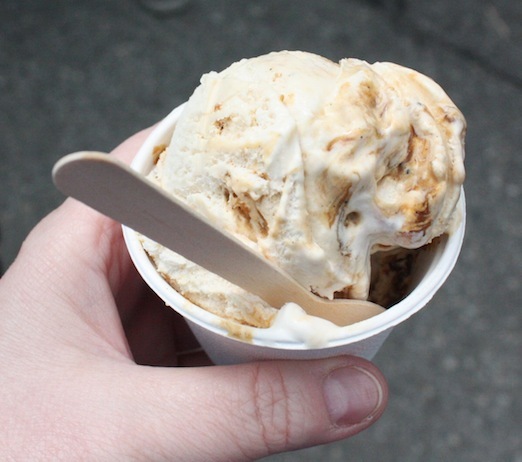 We looked at their inventive flavor profiles in their ice cream, and sampled all three. 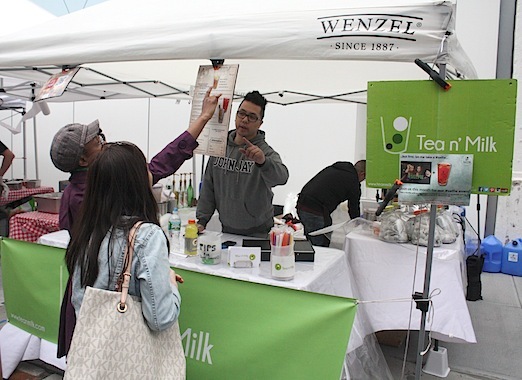 In the end, we got a scoop of Tea Dance—it was the lemon charcoal caramel part that really sold me. Really delicious. Prior to eating ice cream, we had a platter of chicken from Khao Man Gai, purveyors of fine Thai street food, recommended by both Emily and Mathew (from Tea n’ Milk). 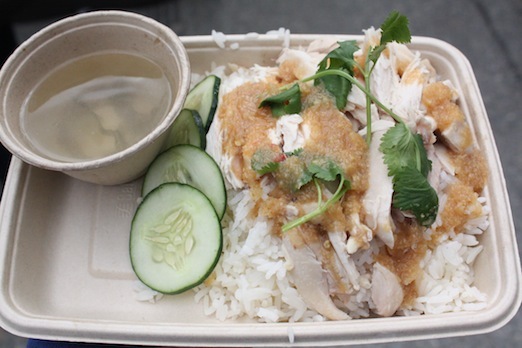 The platter, also called Khao Man Gai, consists of rice, poached chicken, a ginger sauce and a small cup of broth that you sip in between bites. Oh man, it was good, and the ginger was the perfect thing for my upper respiratory yuck (stupid pollen). 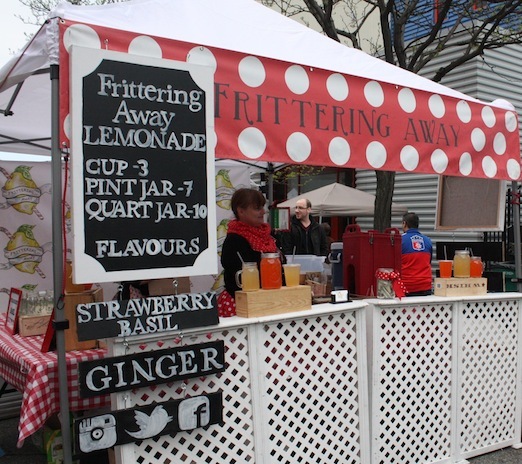 Next we stopped by the Frittering Away Lemonade booth, home to tasty drinks, including a wonderful strawberry basil lemonade. They were kind enough to give us a little sample of said lemonade, and next time I plan to get an entire serving. 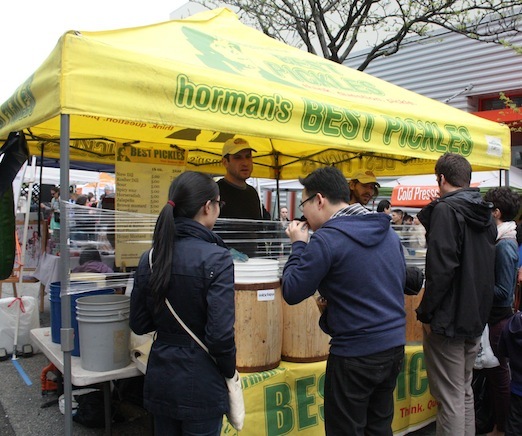 On encouragement from Emily and her husband Daniel, we hit up the Horman’s Pickles booth. They make a whole variety of pickles, but what caught my eye was the Moroccan Lemon Kraut, which I was told was naturally fermented and flavored with preserved lemons. Total yum. And a big score for only $5 for 16 oz! And who doesn’t love a giant pickle display? 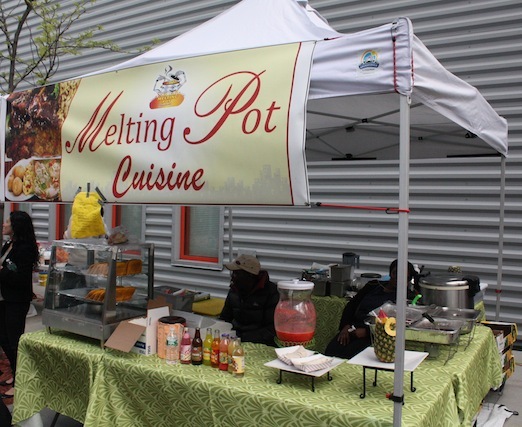 Great to see Melting Pot at the Flea! I hope they bring the sorrel drink one of these weeks. 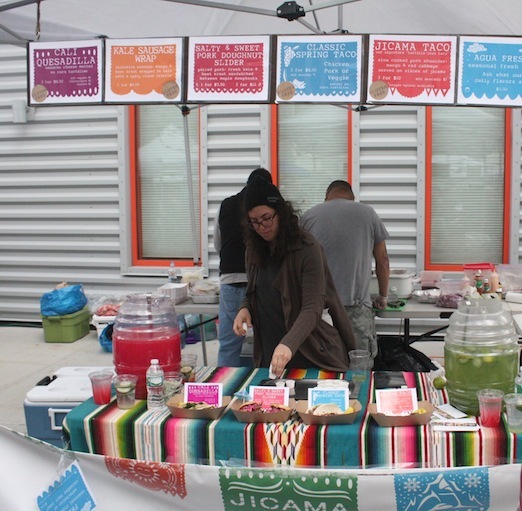 Jicama NYC was there, too, offering options for all sorts of diets, including vegan and gluten-free. 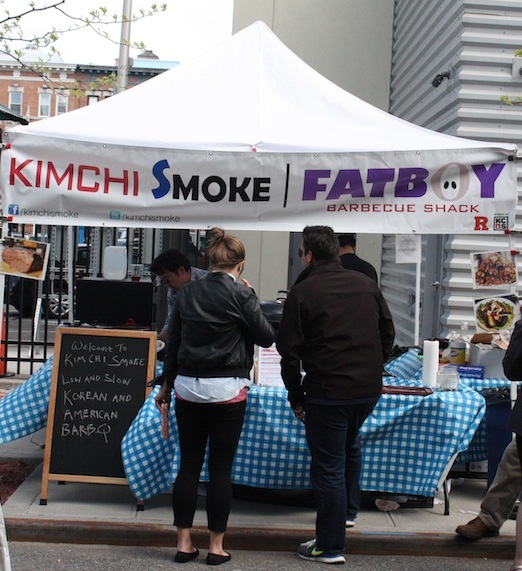 By the time we got there, Kimchi Smoke was slowly running out of things, so we decided to try them next time. Our friends from Luludi were there. 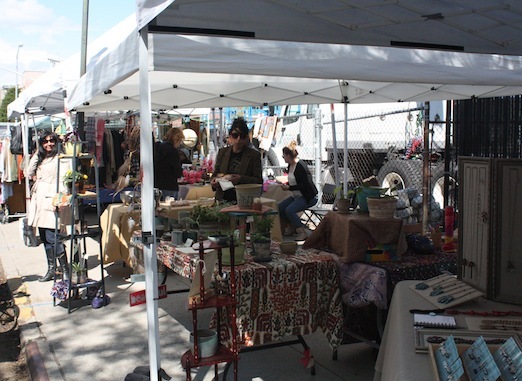 At this point we were at the Flea side of things. There were photos and art. 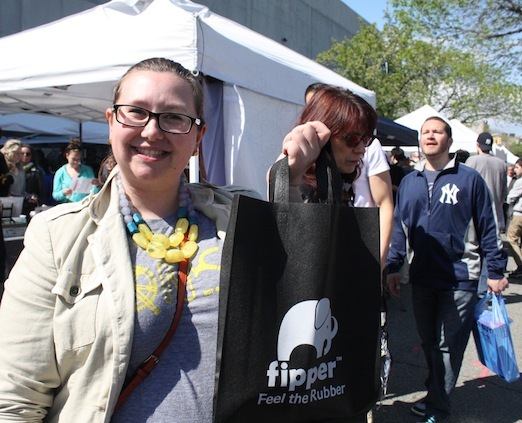 Emily got some Fipper flip flops, made from natural rubber. 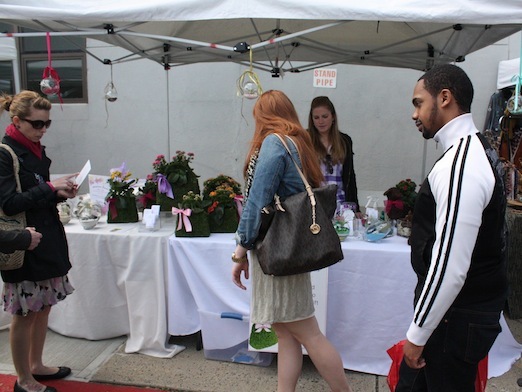 Lots of jewelry, plants, and clothes. This Scrabble tile art was so much fun! Here’s the view of the Flea from the 34th Ave side. 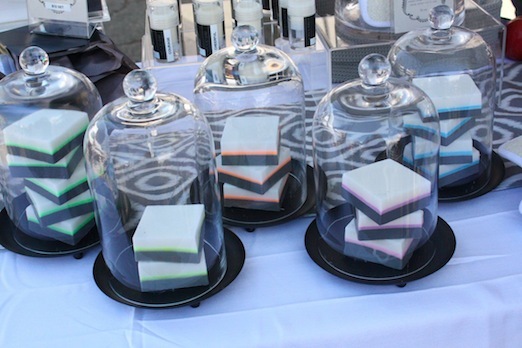 I bought some soap from Noctua-Diem—the “mental clarity” mix (one can never have too much mental clarity). Noctua-Diem had lots of nice smelling things for sale. On the way back toward 35th Avenue, I stopped and bought some delicious chocolate. The final stop was at the Oconomi stall, where Emily and Daniel picked up one last dish. It got crazy windy then! And it rained a bit. Sun-showers are really pretty, though. 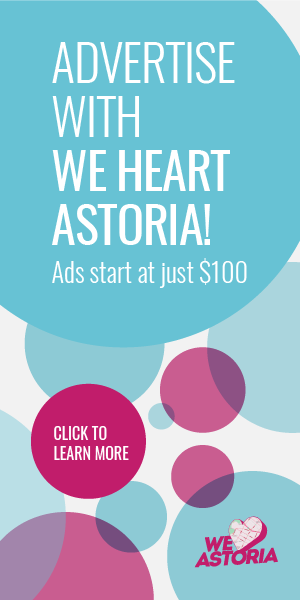 So, congratulations to the organizers and participants of the Astoria Flea and all of us here at We Heart Astoria wish you much success! 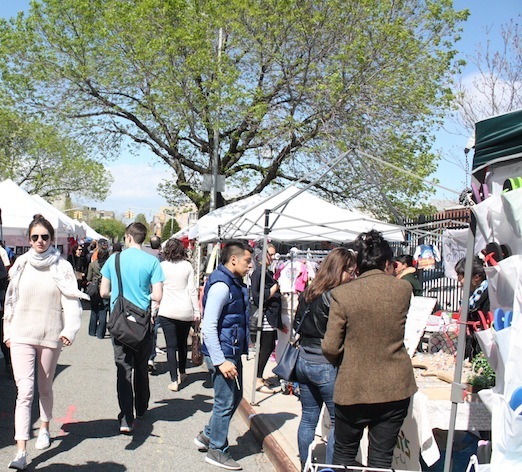 Astoria Flea and Food, May 4-June 22 (maybe longer if it’s a success), 36th Street between 35th and 34th Avenues, Astoria. 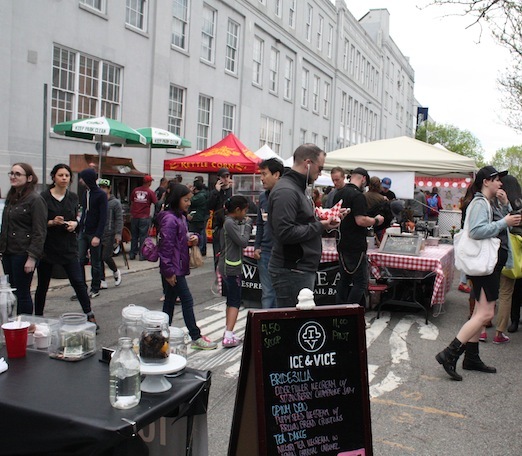 A lot of vendors were completely sold out at 4p. Which was fantastic to see, glad the community supported this so well in Week 1. Yeah!! The Flea was amazing! It’s going to be very bad for my wallet (and waistline if the arancini guys stick around), but I’m definitely coming here regularly. 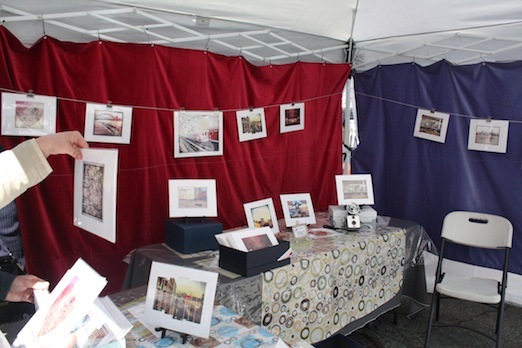 The wind was no joke- I was chatting with a vendor who sadly lost a few items to a cruel gust.